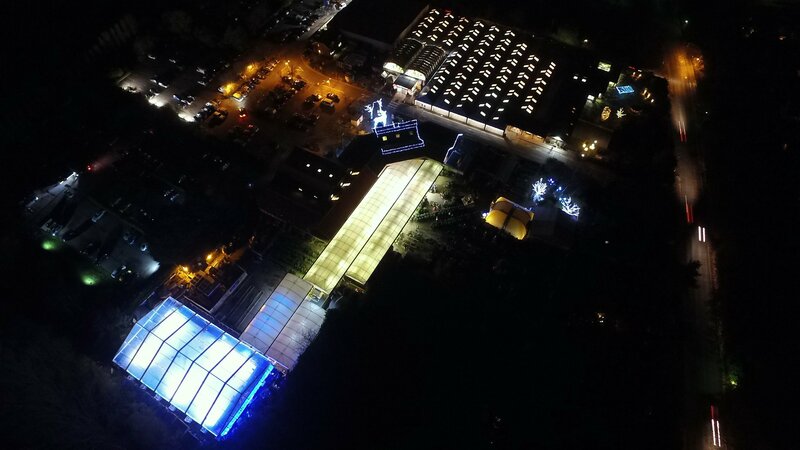 We were once again contacted to provide Bournemouth Lower Gardens with their temporary ice rink for the festive season. The location is a five-minute walk from the main shopping centre, beach and pier. The ice rink is very popular with skaters and the client, again, wanted to increase the size of the rink and include something different to the main pad to enhance skaters experience on the ice. With our proven track record and reputation in giving our clients’ the best quality product with the most efficient installation possible, we were happy to fulfil their requirements based on their needs and budget. The main rink in Bournemouth’s Lower Gardens was over 300 sqm bigger than last year and measured over 850 sqm in size, which gave ample space for a significant number of visitors to skate at one time. A new addition was also installed with an ice path/track linked to the main the rink. Skaters could choose to skate around the wooden barrier pathway, under the festive lights and stop for the perfect photo opportunity. For the younger or less confident skaters, Icescape installed a separate nursery rink over 150 sqm with white and clear barriers. This provides the perfect space for little ones to discover and enjoy the experience of ice skating away from the busy main ice rink. In the evening, the nursery rink was transformed into an ice gliders space for the adults. The space can hold up to four lanes, where adults can enjoy a fun game of gliders with friends and family. The rink also featured a rink side Moguls Bar where customers could enjoy a large selection of tasty food and drinks. The heated area also featured VIP areas and regularly had live music and entertainment. As one of the largest and most experienced temporary Ice Rink hire solution suppliers in the UK, we pride ourselves on offering the most efficient and highest quality products on the market. This gives our clients’ customers the best standard in skating experiences no matter the size, or location of the rink. With our award-winning temporary structures and flooring systems, the location of your rink can be almost anywhere. If you are interested in using our services, contact us here.